Scroll to see the current sculptures available for purchase. For more images of each sculpture, click on the relevant gallery from the Gallery drop-down menu above. ​No-interest payment plans are available! For more details, visit our payment plan page. We're not certain if his mother meant to name him this, or if she happened to hiccup when the naming ceremony arrived – either way, Hiccup grew up to be a rather ardent guardian of the wildwood who doesn't like to be teased about his name. His grapple plant spikes are not something to joke about. Hiccup measures about 7" tall by 4" wide. This sculpture is made with wood, dried grapple plant, rambutan husk, polymer clay, acetate, copper, hematite, cotton, ostrich feathers, acrylic, linen, wool, dried moss. 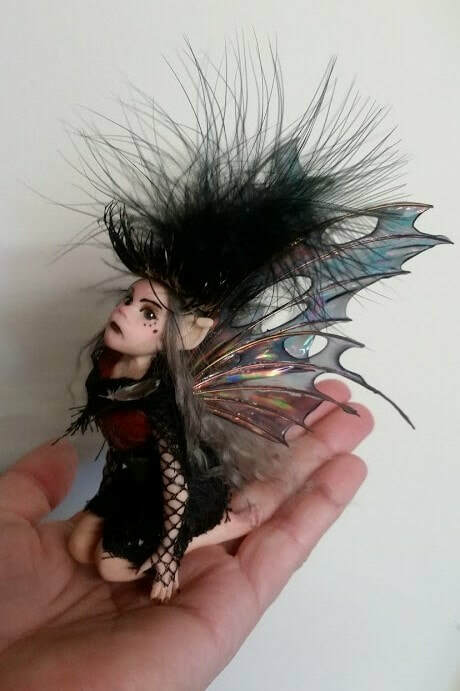 For more images of Hiccup - please visit the Faery Gallery. If you search tide pools very carefully, you might find a tide pool mermaid enjoying a shell hammock after a day of exploring. Keyara collects sea treasures in her shell, but she's quite a treasure herself! Her crown is hand sewn with tiny glass beads. Her lovely tail and flesh shimmer a magical golden hue. Her eyes catch the light in subtle ways - mermaid enchantments at work! 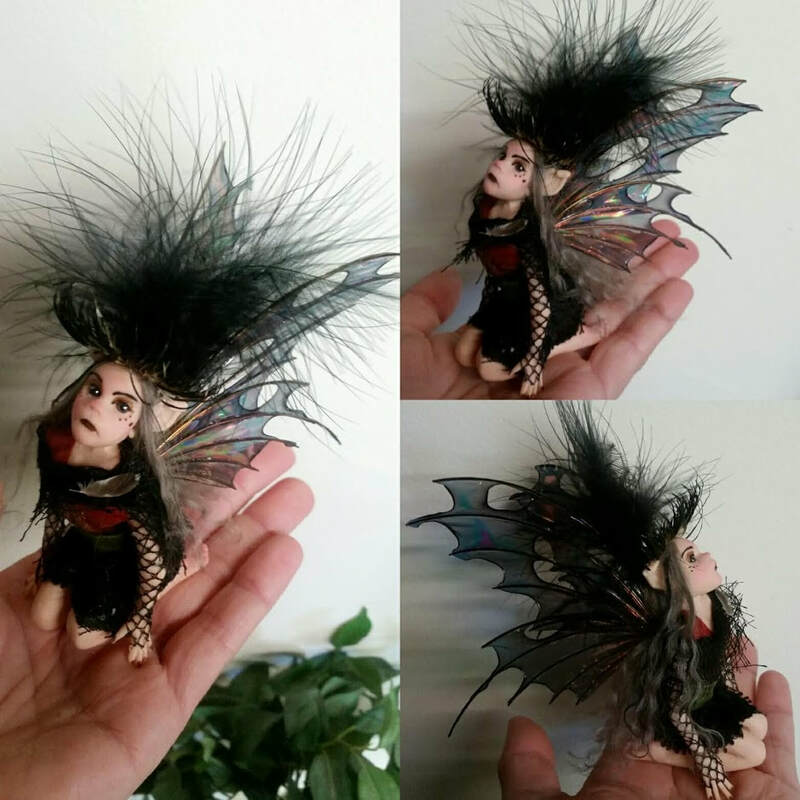 I finally caught the naughty little faery who has been stuffing my gloves with thistles! We keep her under a glass cloche where we can keep an eye on her during the day. Don't worry - Spook doesn't let a little glass keep her trapped - but she seems to really like staring out through the dome. 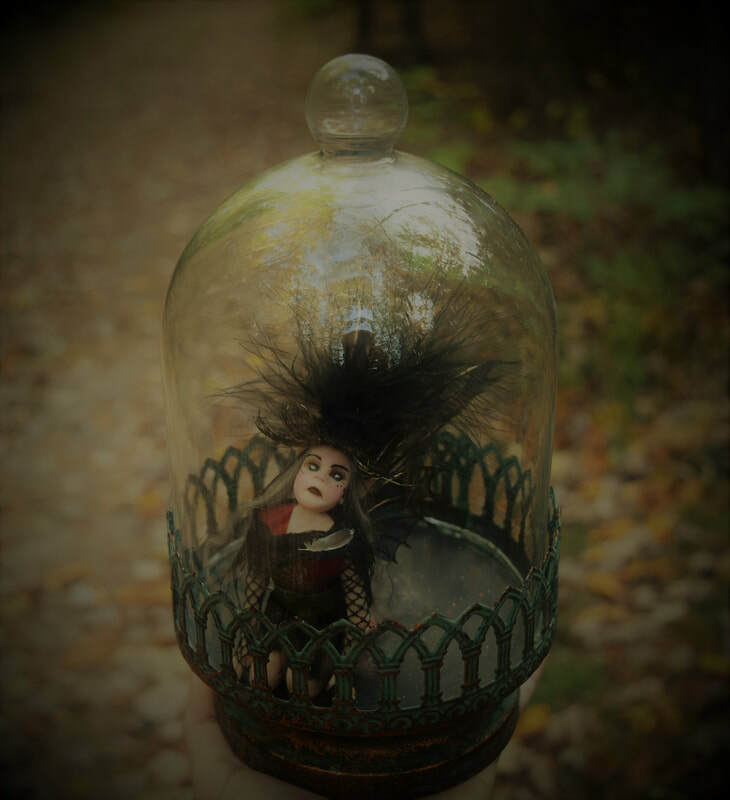 Spook comes with her glass and metal cloche/dome. She can come and go from it as she pleases (in other words, she's not glued in!) so we suggest putting in some little baubles and trinkets to keep her inside and out of mischief! As seen in Issue #11 of 'Just Steampunk Magazine!' Unknown lands are simply friends he's yet to make. sparks of invention are his children, and Lady Adventure is his wife! Hawthorne Q Dashwood is completely aware of (and accepts without timidity) that his shirt and waistcoat are too small to button up. Fashion takes a back seat to exploration! Your sculpture is one of a kind and no molds or prefabricated doll parts were used in its creation. The Silver Branch sculptures have found homes in collections and galleries all over the world! You will receive a certificate of authenticity, a display card with a snippet about the sculpture and the sculpture's unique story! ​Your sculpture will come well packaged with tracking and insurance included. Returns are allowed as long as the sculpture is shipped back with postal insurance within 7 days of receiving your package.